As far as the world of metal is concerned, it's difficult to name a more important or influential band in the genre's long and riff-filled history than Iron Maiden. From helping to kickstart the rise of the NWOBHM movement from the back rooms of East London's pubs to becoming one of British rock's most recognisable names, they redesigned metal for a whole new generation of fans and created some of the genre's most-loved and best-known songs while they were at it. And oh, the songs – all 187 of them. 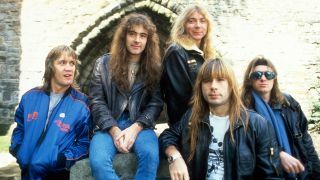 From the ridiculous to the sublime, from the riff-heavy thrashers to the sprawling prog epics, Maiden's best songs are the sound of a band at the top of their game, laying down a noise that most other bands could only ever dream of getting close to. But what is the best Iron Maiden song of all time? From the anthems to the deep cuts, every Maiden fan will have their own personal favourites – which is why we're placing the final decision on your hands. Sick of seeing Run To The Hills at the top of every single list like this, or would you fight tooth and nail to protect its rightful place as number one? We're handing the power over to you. Each of Iron Maiden's 187 songs are included in the list below, so scan it thoroughly and cast your votes – you have five votes each, so use them wisely. There's also an option to add your own suggestion should there be a specific obscure B-side we've forgotten that you feel deserves its dues.